Who was Constance Fenimore Woolson? 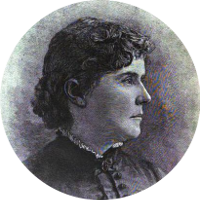 Constance Fenimore Woolson was an American novelist, poet, short story and travel writer. She also wrote under the pen name Anne March. Her stories were mostly about the Great Lakes, the South, and American exiles in Europe. In 1894, she tragically fell or jumped from a 4th floor window of her apartment in Venice, Italy, and was buried in Rome. Today Constance Fenimore Woolson is increasingly at the high school and university levels in the U.S., U.K., and Italy. In 1995, a group of Woolson scholars organized The Woolson Society which continues to hold conferences and study Woolson to this day. In 2016, the President of the Woolson Society, Dr. Anne Boyd Rioux, published the first full-length biography of Woolson titled Constance Fenimore Woolson: Portrait of a Lady Novelist. It seems only fitting that Constance Fenimore Woolson has a number of famous literary kin including her granduncle James Fenimore Cooper , author of Last of the Mohicans. Other notable literary kin include poet Emily Dickinson, author Harriet Beecher Stowe, and poet Ralph Waldo Emerson. One of her more interesting connections is to the last surviving member of the Union Army during the Civil War, Albert Henry Woolson. Constance Fenimore Woolson has a few former U.S. Presidents in her family tree including Franklin D. Roosevelt, Millard Fillmore, Herbert Hoover, Gerald Ford, Calvin Coolidge, and both Presidents Bush. She has a kinship to the royal family through a connection to the late Princess Diana. Celebrities found in Constance Fenimore Woolson’s family tree include fashion designer Gloria Vanderbilt, actor Ben Affleck, TV journalist Anderson Cooper, comedian Chevy Chase, actor Oliver Platt, singer and actor Nelson Eddy, singer and songwriter Harry Chapin, and actress Lillian Gish.